So... What's up with the texture for the sky? It's just... Blank. Also, all of the roofs are white in Blender. Any idea on how to fix this other than to go into Photoshop and edit them? Huh, I thought I fixed that. Fixed. 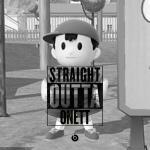 I highly suggest not going in, Ness. Okay?